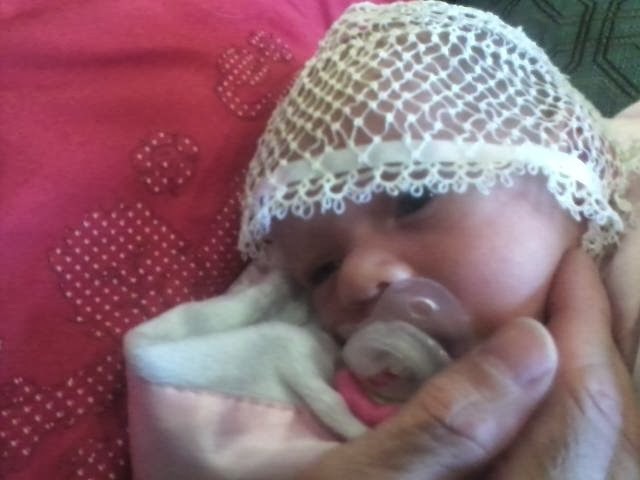 The Baby Bonnet, The Dress Isn't Complete Without it! I did not take pictures of how this bonnet was made and have made 2 more since and I use a white new born fabric cap for size pattern to make up. I used netting and little rings and chains and the one shuttle tatting to connect the back and front together! At the time I made this pink bonnet I was making and selling shuttles and the bonnet is made in 2 parts. Shown on this pink cap separate, the side strip and the back. It was so light she didn't mind it on and she was days old in this picture! The back is made first, so I get an idea of how long to make the strip, and how to match up picots when tatting it together! The final ribbon that you cannot see (was placed under my husbands hand on bottom of bonnet and 2 pieces of ribbon were sewn on between the side and back piece on each side) was attached in the back and tucked the bottom a bit to snug to fit head! Don't want to tat more than needed ha ha! Made collar first and then added tatting. Sorry can't seem to get pictures in order, next post will be bonnet, then the the complete on baby. As tiny as it was, it still seemed to gobble the baby up! I placed the tatting on after completing the sleeves. Inserted lace down the front before sewing bodice, keeping size with pattern piece. because fabric so light and gauze like. Gold buttons down the back! This is the dress in window that shows how thin the fabric is. I had to buy lace for bottom edge, ran out of time! This dress was in the makings in my mind before I knew how to tat lace, I saw one like it in a historical pioneer home. Wanted to make one for my baby, never felt confident to make it, and so first granddaughter got it! pattern is from "24 Snowflakes in Tatting"
Front panel was made first and fabric was so gauze was hard to stitch on machine. Needed to tat little more for top to achieve correct look. I made this a couple years ago and a youtube video that didn't come out so good, so I thought I would display it here. Have 20 more spokes to go! Thought I would place this doily on the glass top table; with the either the messy unorganized items, or the get you in the tatting mood inspirational ideas, fun shuttles etc. Take your pick! Deciding what to do and or what color to use! I had to start something was so excited, and love this pattern. Along with so many others! Sometimes or most of the time I have so many ideas that not sure what I want. So I finished this little strip off and gonna start a different one in different color! Cant make up my mind! I had fun making this one, but now is a good time to talk about the camera! All pictures were taken in the same light. but with different color backgrounds! This reminds me of cherry blossoms I use to see when I was young. I feel the blue jeans, and flowers, look closest to the original color. Even though they are close, the color was still a little pale to real life. It is dark out side now, but mostly I enjoy an out side cloudy day the best for true color! The turquoise will come into play again at the end. This white gets tricky to deal with, how you join picots makes a difference, as shown below. Found that it is best to attach picots the most common way (no flipping or folding, just through the top). This is the front side, less white dots showing through. This makes a unique pattern. Flower Instructions For A Happy Valentines Day! Two of these hearts have a fun and easy flower that's all chains. They just spin around. I invented a cool easy pattern for a flower! at least I haven't seen one like it yet! I want to call it my "first flower" because it is done with all chain and no rings and for those who haven't learned rings yet, can tat this! The red heart in center at top photo also shows a variation of this flower too, so yours can be unique to you! below is basic instructions and picture of back side of flower! With two shuttles in two different colors you just start with 4 double stitches and picots in between all double stitches then connect at beginning and make 8 more ds. with picots and connect at top and then 16 with picots connect, then you switch shuttles, begin with other color for petals. Each petal has 8 double stitches separated by 2 picots attach petals every 4 picots of opposite color. Till you have 5 petals. I made one mistake on this one at end I should have connected ant same place picot started! As shown on the last heart above! You can have lots of fun changing color and size of flower adding more petals and larger centers too! Let me know if you want further instructions I am not that great with writing them out, got to work on that! This is a little delicate heart ! I did place the beads on the shuttle first, but sometimes I forgot to side them onto the ring before tatting so thought I would explain what to do if you forget! Can be done with crochet hook if beads and thread are larger but if not try this! The bead was not big enough to fit the bead with four threads through it, so I used this method to place bead on, the purple is "ring thread" notice above picture and then it is slid down. I put shuttle through where you see the pink thread, then continued on finishing the ring. More motifs to display in a special way! All hearts are ready for the wrist so you can start minding! Mixed Lizbeth color heart with Island Breeze and coral pink or salmon can't remember!